After a long and exhausting race that finished deep into the night, some relief was most welcome. The eleven-mile Dermoshop/Confido Kihnu - Pärnu race of the A. Le Coq 61st Moonsund Regatta was seen off at midday. The winners of the fast and short race were: Tegu (Vilnius, Lithuania), Adele (JK Baltsail), Lastochka (Orekhova harbour, Russia), Credit24 Reval Cafe (Kalev Yacht Club), Liliann (Saaremaa Maritime Sports Society), Wenna (Kalev Yacht Club) and Linda (Kalev Yacht Club). This year the Moonsund Regatta is a celebratory one. Besides being dedicated to the centenary of the Republic of Estonia, it will also mark the 90 years of the Estonian Yachting Union and 70 years of Kalev Yacht Club. Who will win the first leg of the A. Le Coq 61st Moonsund Regatta? The A. Le Coq 61st Moonsund Regatta proudly begins today, highlighting Kalev Yacht Club’s 70th birthday, Estonian Yachting Union’s 90th anniversary, and the centenary of the Republic of Estonia (Estonia 100) during the week of upcoming races. Thursday was the day for short races in Pärnu. Inshore circles have always been highly expected and beloved events of the Moonsund regatta, also this year. Although, instead of three, only two races could be held, they were exciting and eventful enough for no one to be left disappointed. On Thursday, July 13th, there will be sixth course of the A. Le Coq 60. Moonsund regatta - DANSKE BANK inshore course on Pärnu Bay. You can follow the racing through the Live Stream of regatta's Media Partner Eesti Meedia Postimees. Live Stream will start at 9.50 am and the first warning signal has been scheduled for 10:00 am. There are three races scheduled and the live streaming will last until 2 pm. On Monday morning the fleet of 842 participants of the A. Le Coq 60th Moonsund Regatta saluted the sun in Roomassaare. The weather was brilliant and wind playful with the waves. Everyone was excited about the short circle around Abruka Island. The festivities of the anniversary regatta were kicked off on the 7th of July and the first race on Saturday took more than 140 boats on the Smarta.ee leg from Haapsalu to Kuivastu. This is the timetable for buses taking the sailors from Haapsalu to Rohuküla and back to Haapsalu on July 7-8. It's a traditional song festival rotating on the small islands of Estonia already for years. As on Saturday, July 8th, when the Muhu väina regatt will arrive in Muhu island, Kuivastu, the sailors have an option to join this party. Entry is free of charge. There will be a lot to enjoy in all marinas during the regatta - enjoy! In co-operation with Go Bus the organisers are offering the option to drive from Tallinn (with a stop in Pärnu) to Riga to be there for the celebrations in Riga on Saturday, July 15 and back to Estonia the same evening for those who are not planning to sail back home. 129 boats entered to our jubilee regatta by the evening of May 31! Invite your friends to get this wonderful regatta feeling! If you would like to receive Regatta News in your inbox, just fill out the form below or just leave us your e-mail address. Don't forget to add uudised@kjk.ee to your address book so we'll be sure to land in your inbox! The footage below (click on the photo for video) from the Tallinn Bay which was recorded for the Postimees Live Stream and dates back to July 16 during the A. 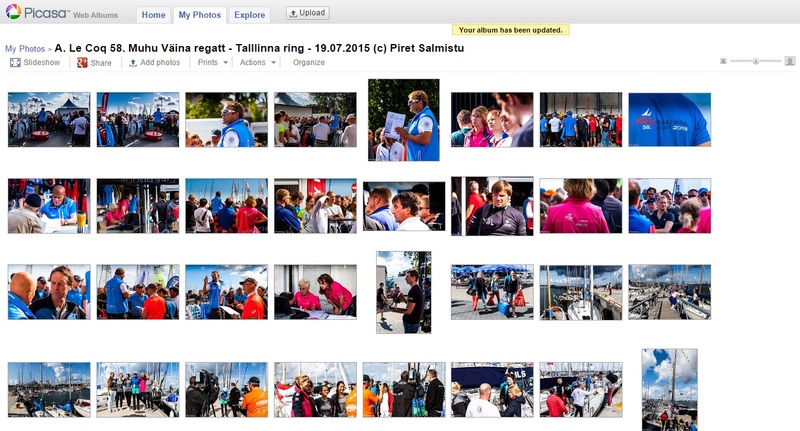 Le Coq 59th Muhu Väina regatta’s final leg has been living its own life in the internet and social media for a week now. This video of the Аля Кубанеццц' mast-walk was recorded from the organizers’ media boat Storm Hunter doing the Live Stream from the final inshore races of the regatta. During one week 111 yachts from five countries and with almost seven hundred sailors on board raced 250 miles and visited the harbors of Pärnu, Kihnu, Haapsalu, Kärdla and Kalev Yacht Club. The last races and the award ceremony took place on July 16 in Tallinn. The fifth leg of the A. Le Coq 59th Moonsund Regatta was Musto Kärdla – Tallinn race. Weather forecast was contradictory and many yachts decided to leave early and not participate in the fifth race. Twenty yachts bailed and only 88 yachts took part in the longest race. The promised wind did not arrive, however, and the participating sailors could enjoy both the sunset and sunrise during the long night of the race. The fourth racing day of the A. Le Coq 59th Moonsund regatta faced its morning in Kärdla harbour. Wednesday morning was sunny and at the captains meeting a rare downwind start was announced. The festive opening of the regatta was held on the evening of July 9 in Pärnu where the sailors were greeted by minister Indrek Saar, deputy mayor Rainer Aavik, Pärnu YC commodore Väino Hallikmägi, Egon Elstein from the Yachting Union and Margus Hiet representing Saaremaa Marine Sport Association in Pärnu Yacht Club. The speeches were followed by mellow music and a long-awaited summer party leaving also time for plotting for the long regatta ahead. Very cool and trendy regatta gear is ready and awaiting the sailors at the HH pop-up stores in Pärnu and Tallinn! There will be a limited number of items – hurry up, dear sailors! 116 has been a record number of the Moonsund regatta so far, which dates back to 2014. Since there is still more than a month to go to the regatta, the organizers are hoping to see some more boats, and who knows, maybe even a record number of participants! Seven days of the marathon offshore regatta found its festive conclusion in Pärnu on July 25. The 300 nautical miles regatta took 114 yachts and almost 700 sailors from Estonia, Latvia, Lithuania, Russia and Finland from Tallinn to the final destination Pärnu Yacht Club through Kärdla, Kuivastu and Roomassaare harbours. Award ceremony was held both to the winners of the A. Le Coq 58th Moonsund regatta and the Estonian Folkboot and ORC III champions. A. Le Coq 58. Moonsund regatta’s last but one leg – the Pärnu circle – was very different from all the previous races. The 14-16 mile race in good weather felt like a walk in the park after all previous exhausting races. However, the 10-11 m/s wind and waves made starting quite tricky. Most leaders held on to their positions but the final results will be clear, of course, only after tomorrow’s short track races. The fourth leg of the regatta was not easier for the fleet than the previous races. Decent western winds of 10-11 m/s meant sailing in the wind’s eye and also many teams had to come in more or less direct contact with “rocky terrain”. The good thing is that all those who preferred it on “the rocks” managed to be on the starting line in the morning after some minor repairs. Today the fleet is headed for Pärnu. The first two races of the regatta were really tough due to big waves, strong winds and long distances but the morning of the fourth day showed a much kinder face. Sun, relaxed atmosphere and more than 20 degrees made the Monday morning very enjoyable indeed. Just that the slight and moody winds made the third leg of the regatta a lottery for most of the sailors. If you are following the racing of the Folkboots, you must know that the fleet of Folkboots decided not to go to Roomassaare and will sail to Kihnu island instead and from there to Pärnu tomorrow. Regatta was opened at the main stage of the Tallinn Maritime Days today at 7 pm. Find the RACE OFFICE of the Moonsund regatta in Seaplane Harbor where are Helly Hansen flags and shop. Helly Hansen / Sportland Special Edition - polo shirt of the regatta now available. Please read the GPS Tracker Instructions and be visible for your friends and families ashore and for your fellow competitors at the sea! You can join the spectators' boat - steamship Katharina - on July 19 to see the start of the Moonsund regatta. Buy your ticket online today to be sure you won't miss this opportunity! There are lot of entertainment going on in every pit-stop of the regatta! Enjoy! A co-operation contract between NGO Estonian Maritime Rescue Organization and one of the organizing clubs, Kalev Yacht Club was signed to secure Moonsund Regatta last week. The Estonian Maritime Rescue Organization was represented by Madis Rehepapp and on behalf of the Kalev Yacht Club the contract was signed by the Commodore Kalev Vapper. Make sure to enter and pay your entry fee by May 30 to save 20 euros per person! A brand new harbour building will be ready for the Moonsund Regatta in July 2015! The article was published in the magazine PAAT in the first place. For the first time in history Estonian Sailing Congress was held on April 17 in Tallinn. A. Le Coq 57. Moonsund Regatta celebrated its finish in Roomassaare after a week full of events. This year’s regatta welcomed the largest fleet ever – 116 yachts with the total of 730 crewmembers on board: 90 yachts from Estonia, 8 from Russia and Latvia, 6 from Lithuania and 4 Finland. Also in Roomassaare marina you'll have a chance to rent Bali powerbikes. Shopping tours from Roomassaare marina to Selver - the buses will take you there and bring you back! Take a chance and use this shopping arrangement! On Wednesday, July 16 from the Pärnu circle starting at 11.45! Channal 2 was visiting Kärdla marina to interview Agnes Lill, the regatta director; Ülo Vooglaid, the winner of the 1st Moonsund regatta and Juss Ojala and Kaarel Kruusmägi - the winners of the regatta for the masters on Optimists. Shopping tours from Kärdla and Roomassaare marinas to Selver - the buses will take you there and bring you back! Take a chance and use this shopping arrangement! The entertainment program in the marinas is more or less ready, but will be amended daily! Have a look and invite your friends to partake in the marina events! A. Le Coq and organisers of the Moonsund Regatta - ESS Kalev Yacht Club , Pärnu Yacht Club, Saaremaa Marine Sports Society and the Estonian Yachting Union - signed a sponsorship deal that will make the biggest beverage producer the presenting sponsor of the Moonsund Regatta. July 19th in Roomassaare - Enjoy! The 56. Moonsund Regatta established new offshore sailing champions in three classes: ORC, ESTLYS and Folkboot. Moonsund is the longest established offshore sailing event in Estonia. This year’s regatta hosted a 113-boat fleet with crews and more than 700 sailors hailing from Estonia, Finland, Sweden, Latvia, Lithuania and Russia. The regatta set sail on July 14 in Haapsalu and proceed through the ports of Heltermaa, Kuivastu and Pärnu towards the final destination Roomassaare. The new offshore sailing champions were determined in six different races of the week-long regatta that included both shorter circles and one through-the-night offshore race. Each class raced its own courses ranging from 161 to 257 miles. LNT - the largest channel in Latvia introduced Muhu Väina regatta in their Sport News on Saturday, July 20th showing their Latvia Sail Racing Team Bellatrix EST499 with Andrejs Buls' team winning the 4th place in overall in Muhu Väina regatta 2013. The course lasting almost 14 hours on the route of 91 miles won in group ORC1 s/y Olympic Online from Dago YC with Tiit Vihul in Helm. The Race Committee meeting for skippers will take place on Saturday July 20 at 8:15. The leaders by groups are Amserv, Katarina II, Jazz, Prizrak, Tessa, La Folie and Tuuli. Prizes from Dermoshop and Joogikuller. Watch great gallery and videos of Heltermaa-Kuivastu course by Delfi. Bus transfer will help the crews of yachts staying in Rohuküla harbour from there to Haapsalu and back. Prizegiving ceremony, galadinner and the official afterparty! The 56th Moonsund Regatta, the longest-running offshore competition in Estonia, which is also the Estonian Offshore Championships for ORC, ESTLYS and Folkboot as well as the third stage of the Estonian Offshore Cup of the Estonian Yachting Union, will take place from 13-20 July. The Regatta will take place on the route Haapsalu-Heltermaa-Kuivastu-Pärnu-Roomassaare. Saturday, 17 July, the third stage of the Offshore Sailing Estonian Cup came to its finish. The 53rd Muhu Väina Regatta with nearly 600 participants on 89 yachts, which is also the record since regaining of independence, from five countries covered a distance of 200 nautical miles on the route Pärnu-Roomassaare-Virtsu-Dirhami in six days. The Muhu Väina Regatta was also a competition to find out Estonian champions in offshore racing and in class X-41. The keywords of the Regatta were an excellently warm summer weather and lack of wind.